We stayed at the Monte Carlo this time and decided we should go see Mamma Mia, the smash hit musical based on songs by the Abba's . The play was at the Mandalay Bay theather. We are just getting out of the hotel and on our way to Mandalay bay to buy the tickets. The MGM grand is on the background. In Vegas, everything seems like next door, but don't be fooled by it. It is actually pretty far if you decide to walk. We got smarter this time and took the Tramway to Mandalay Bay to buy our tickets to the show. Just getting off the Tramway, we stumbled on a knight at the Excalibur. Riding a carriage led by horses, just like in the old days. Having a quick snack at New York, New York, while waiting for the show to start. Kevin thought the show was boring because he is not familiar with the Abba. Hoa and I thought the show was very good and it sure brought a lot o memories on all the hit songs in the 70'. 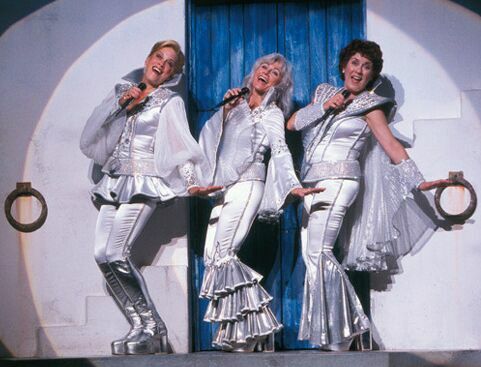 I actually remember the original Abba dressed this way..